Santo Domingo, capital of the Dominican Republic, was founded by Christopher Columbus’ brother, Bartholomew, and it is the oldest European city founded by Europeans in the New World. It was the first seat of Spanish colonial rule in the New World. Since then, Santo Domingo has been home to nobles and knights, soldiers, monks and slaves, pirates and damsels in distress. Here you can find everything from an active nightlife to historical sights. The city is also one of the best places to shop in the Caribbean, and the hottest item on sale is the hand-wrapped cigars along with local handicrafts. When the city was founded on the southeastern Caribbean coast in 1496, it was named New Isabella and was much later renamed Santo Domingo. Since then, it has had a long history, interspersed with glory and destruction. Even today, the city reflects its French, Haitian, and Spanish heritage. Santo Domingo is located on the Hispaniola coast where it meets the Caribbean Sea, which makes it a great vantage point for trade, and sure enough it furthered the city’s economic development during colonial times. The Ozama River, located to the east of the city, is the country’s busiest port. Santo Domingo is relatively low in altitude and the average temperature varies little in the city. However the country does experience two seasons, winter and summer. November to April is winter characterized by relatively lower humidity levels and low precipitation. December and January are the coolest months, while July and August are the warmest. The humidity makes it seem much warmer than it really is. The tropical climate however, makes the region very vulnerable to hurricanes. Before the region was discovered by European settlers in 1492, the Taino Indians lived on the island of Hispaniola. The modern city was founded on August 5, 1498 by Bartholomew Columbus. Christopher Columbus set up the first settlement here called Navidad after discovering the island in December 1492. He later established a community he called Isabela in the northwest, which Bartholomew later moved to present-day Santo Domingo. Santo Domingo became the first capital of the new territories, the first to have Spanish coinage, a fort, a monastery, a cathedral, a university, a hospital and a palace. It is where Madrid’s rulers in 1512 set up the highest level of its judicial system since the Middle Ages, the Spanish Colonies’ first royal appellate court. Governor General Nicolas de Ovando arrived here in 1502 but the region was destroyed by a hurricane shortly after his arrival and he had it rebuilt on a different site nearby. The original layout of the city and a large portion of its defensive wall, many 16th century buildings and structures are today part of the Colonial Zone, declared a World Heritage Site by UNESCO in 1990. In 1586, Hispaniola was invaded and ravaged by Francis Drake weakening the Spanish dominion over the island which had served as a capital for over 50 years but was now abandoned and left to the mercy of the pirates. Then again in 1655, the island was invaded by the French. Later on, in 1822, the Haitians commanded by Jean-Pierre Boyer, took over the entire island. Finally, in 1844, the Spanish part of the island regained its independence after 22 years of Haitian rule due to a group of patriots headed by Juan Pablo Duarte, Francisco del Rosario Sanchez and Matias Ramon Mella. From then on, the Spanish part of the island became the Dominican Republic. 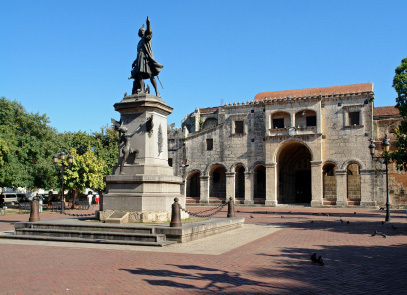 Since its new settlement, Santo Domingo became the launching pad for many explorations to the New World including the expeditions that led to Ponce de Leon’s discovery of Puerto Rico, Hernando Cortes’ conquest of Mexico, Diego de Velazquez’s expedition to settle Cuba and Balboa’s sighting of the Pacific Ocean. Serving as the base of exploration, the seaport soon became the center of Spanish activity in the Greater Antilles. Santo Domingo celebrated its 500th birthday on August 1998.